View across Muskoka River at the swing bridge, Huntsville, Ontario. Dr. Howland's General Hospital on left. Can anyone identify the women in the photograph? Main Street, Huntsville, Ontario, looking west, before 1907. The sidewalks in this picture appear to be concrete. Granolithic sidewalks were not laid in Huntsville until 1908 after Mayor J.E. Fisher took office in 1907. Can anyone solve this puzzle? View of Huntsville, Ontario, from Lookout Mountain, looking north. Can anyone date this image? Death date of Helen Watson Scott Davidson? Farmhouse at Fairyport, Fairy Lake, Huntsville, Ontario. Northwest side looking toward the lake in the 1930's. Guests seated in front. Group portrait taken at Fairyport, Fairy Lake, Huntsville, Ontario. Can anyone identify the third and fourth persons from the left? Off to war 1914, a friend of Clare Monkhouse. Can anyone identify the soldier and the location? 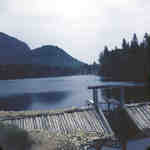 Fairyport Inn sign, Fairyport, Fairy Lake, Huntsville, Ontario, viewed from the water. Can anyone date this sign more specifically? Great Things and ?, 8 Main Street East, Huntsville, Ontario, 1980-1990. What is the store beside Great Things? Water Filtration Plant, 7 Burrow Pit Lane, Huntsville, Ontario, 1980-1990.
Who are the women in the picture? Wardell family on porch of 12 West Road, Huntsville, Ontario. Who are the unidentified people? Wardell family, Huntsville, Ontario before 1911.
Who is the littel girl in the centre of the picture? Dancing Pavilion, Bigwin Inn, Lake of Bays, Ontario. Can anyone date this photograph? Is the Pavillion going up or coming down? Huntsville Public School 1965-1966, Huntsville,Ontario. Can anyone identify the "?" people? Huntsville Public School Staff 1966-1967, Huntsville, Ontario. Huntsville High School, 1927, Huntsville, Ontario. Can anyone identify more of these students? 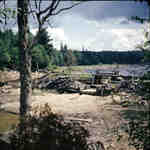 Unknown dam on Big East River system, Muskoka, Ontario,1949. Can anyone name this dam? Distress Dam on the Big East River system, Muskoka, Ontario, 1949. Can anyone varify that this is the Distress Dam? View of Huntsville, Ontario taken from the Lookout Mountain, looking north. Fairy Avenue on the right. Church Street on the left.